This year as a review of the year I decided to start what I am calling the Best of Black Ripley Awards. I decided to use the Best of Black Ripley Awards as a way to document the best of Black Ripley this year. The first annual Person of the Year Award goes to Ms. Fannie Clay. This was quite the tight race. Ms. Clay beat out Louis Napoleon Nelson by only 3 views. I first wrote about Ms. Clay way back in the beginnings of the website and it was honestly just a quick review of her life and connection to Ripley, TN. 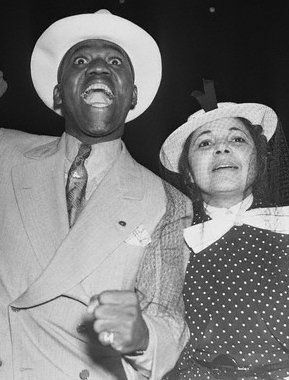 Ms. Clay was formerly the wife of Bill “Bojangles” Robinson famous for his dancing skills and for acting in movies alongside Shirley Temple. Ms. Clay was the daughter of former slaves and a graduate of the 1910 class of Lauderdale County Training School. The first annual Book of the Year Award goes to Finding the Good by Lucas Johnson. The book extensively covered the life story of Lauderdale County’s own Frank Montgomery who also served as the mayor of Henning, TN and the director of the Alex Haley Museum and Interpretive Center. Intertwined with the story of Frank Montgomery we also read the story of Johnson’s own life and we are also introduced to the friendship between Montgomery and Johnson. In telling Montgomery’s story we are also introduced to a host of other Lauderdale County natives and stories telling to the period of Montgomery’s life. This book is a must read for anyone interested in the people and places of Lauderdale County. The first annual Ancestor of the Year Award goes to Ellen Gilliland Clay, my husband’s 2nd great grandmother and former resident of Lauderdale County, TN. I’ve never mentioned her on this blog before, but a big part of my year was spent discovering where she was buried. She died in Memphis, TN and her death certificate listed her burial place as Mt. Zion. Well I assumed this was the Sons of Zion/Zion Cemetery which was one of the first burial places for African Americans in Memphis, but after extensive research I discovered that she actually was not buried there as she was not listed on their burial roles. She was buried in another cemetery known as Mt. Zion in the South West part of Memphis. This cemetery has basically been forgotten and is not listed in the cemetery listing provided by Shelby County, TN. In finding her burial site I was also able to document the burials of hundreds of other Memphians buried on this lot. Early estimates indicated that there are about 300 – 500 African Americans buried there. Her story also led to me uncovering the story of Levi McCoy, the owner of Mt. Zion Cemetery and the Levi McCoy funeral home which handled Ellen’s burial. Today the cemetery is just a vacant lot which is owned by the church next door. There is still more research to be done and if it is discovered that Ellen is not buried there, at least the graves of hundreds of other African Americans who helped build Memphis have been found. It is also important to note that Ellen Gilliland Clay is the mother of Fannie Clay who was honored as the Person of the Year. This story blew up right before my eyes due to it being shared on Facebook. Not only was it the most viewed story of the year it was also the most viewed story EVER on the website. I feel that it touched a special place in the heart of African Americans who had experienced Labor Day in Lauderdale County. There were comments of people sharing memories and speaking of how important that holiday had been for them. Discovering the importance of the Labor Day holiday in Lauderdale County also helped me to understand why my husband insists that we go to Ripley every Labor Day. 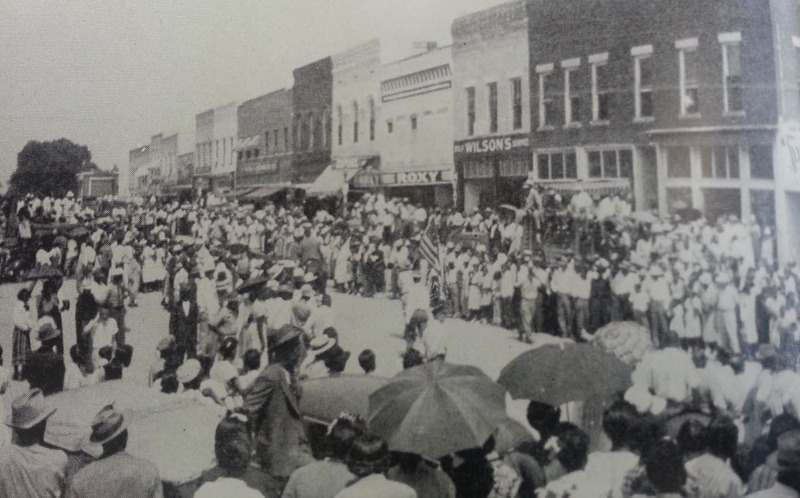 I found it remarkable that a small town like Ripley could become one of the premier places in the country for African Americans to gather on Labor Day. Image Source: Kate Johnston Peters “Lauderdale County From Earliest Times”. Picture taken the first year Rice Park was opened. Any time I have written anything about the Gingery Family it is guaranteed to become one of the most viewed articles on the website. They have proven to be one of the most popular topics among Lauderdale County history lovers and I have to say it is a very interesting story. Two African American brothers killed a white Lauderdale County police officer and his white helper in 1900 and actually got away with the crime. The two brothers who committed the crime ran off and were never heard from again, while 2 more Gingery brothers were hung along with the accomplice that aided the escape of the two brothers who actually committed the crime. As a result of the crime the parents of the Gingery brothers lost 4 sons, 2 to death and 2 to disappearance. It is still unknown what happened to the two brothers who ran away. In addition two of the other Gingery brothers were also found on the 1900 census as residents of the Lauderdale County Jail. In 1917 another Gingery brother killed himself and his wife in a murder suicide. Tragedy seemed to follow this family and it has made their name infamous in Lauderdale County history. And there you have it! The first ever Best of Black Ripley Awards counting down the best moments in African American history in Lauderdale County and all of West Tennessee. What did you enjoy the most about Black Ripley this year? What would you like to see Black Ripley cover in 2014? Feel free to comment below. Thank you for all of your support in making 2013 a great year for Black Ripley. ← A Free African American Male in Lauderdale County in 1840? Fannie Clay was the daughter of Ellen Gilliland Clay, but not the daughter of Hugh Clay. One of my relatives Mrs. Annie Wheeler and you should meet up asap. She is a walking historian and could tell you a lot about the Black residents of Ripley. I will contact her to see if she is willing to discuss with you. She descends from Louis Nelson/ Clays and Halfacre. I stumbled upon Lucas Johnson’s book during my research of Alex Haley. A good read, especially the backstory of Haley’s good friend and Henning’s former mayor, Fred Montgomery.